DETROIT -- What they're lacking in firepower, the Detroit Red Wings are hoping to make up for with depth and excess motivation. After captain Henrik Zetterberg joined the list of injured players Tuesday with a herniated disc in his back, the Red Wings are now curious to see if there's enough left behind to keep winning games. The first test comes against the Philadelphia Flyers on Wednesday night at Joe Louis Arena (8 p.m. ET, NBCSN), when Detroit (14-7-7) tries to extend a four-game winning streak without Zetterberg, Pavel Datsyuk (concussion protocols), Todd Bertuzzi (upper body) and rookie defenseman Danny DeKeyser (shoulder separation). "We've been without [Datsyuk] and DeKeyser for a while … now [Zetterberg's] out, so let's play; let's play right," Red Wings coach Mike Babcock said after an optional morning skate. "It's a real challenge here for [Daniel Alfredsson] and [Niklas Kronwall] to keep us poised and confident in the room and on the bench. I think there's a real challenge for [Johan Franzen] to be a leader, to lead by example and play real hard. When people are out of your lineup there's opportunity for someone else. Someone's going to grab it, so let's see who it is." The options are all over the locker room, starting with maligned forward Stephen Weiss. After signing a five-year contract with Detroit as an unrestricted free agent this past summer, the former Florida Panthers product has scored just two goals with one assist in 22 games. His contract works out to a reported $4.9 million hit against the Red Wings' salary cap figure, so centering the fourth line -- a role he held for five games following a six-game injury absence -- is not what he envisioned. Weiss will move up to the top line against the Flyers, where he'll start out at right wing. Franzen will center, but Weiss could work his way into the center role depending how faceoffs go. Either way, he will gladly take the increased minutes. "This team, in general, has a different style they play, [and] that's been tough to get used to," said Weiss, who started out as Detroit's second-line center. "I've been playing with a lot of different guys over that time. It's a work in progress. Just got to stick with it and keep trying to do little things. All it takes is one little bounce and then things start turning around." "Bottom line, we're in the winning business, so we're going to do whatever we can to win," Babcock said. "[Weiss is] in a situation, just like everyone else, [Datsyuk] and [Zetterberg] aren't here, DeKeyser isn't here, so those are good players that eat up a lot of ice time, so someone's getting the ice time. For me it doesn't matter who gets it. It's just a matter of someone playing good and takes it … ideally that'll be [Weiss]." It could also be Alfredsson, Gustav Nyquist, Tomas Tatar, Daniel Cleary, Justin Abdelkader, Brendan Smith or a number of others with their own personal motivations that may help the team as much as themselves. Nyquist, for instance, should relish the chance to log minutes on the top line. He's very skilled but is typically placed on the third unit and asked to play more of an energy role. After starting the season in the American Hockey League for salary cap reasons, he's scored four goals and has five points in six games since being recalled. 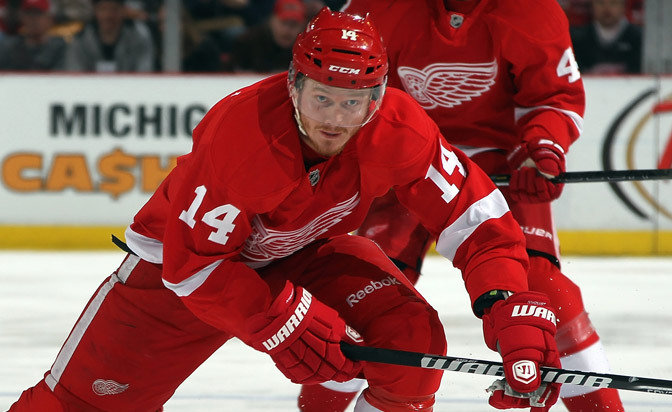 "It's our two best players who are out right now, so we're going to miss them," Nyquist said. "You can't really replace guys like that, but that's the situation and there's going to be more opportunities for some guys to get more ice time and show what they've got. Obviously we'd like to have [Datsyuk and Zetterberg] back, but that's the situation right now. We're just going to have to battle as a team to get through it." The Red Wings have been patching holes all season thanks to a number of injuries, which started at the blue line and steadily worked into the forwards. Zetterberg's back issue just cranked the hurdle up another notch, further challenging those who are left. Leading that charge of late is center Darren Helm, who's had a number of injuries the past two seasons that left some wondering if he'd ever be the same. A back injury caused Helm to miss all but one of last season's 48 games plus the Stanley Cup Playoffs and also the first 14 games of this season. Since returning, Helm has gotten his speed back and centered the second line to great success. He has scored seven goals in 14 games and looks like a guy who's trying to make up for lost time. It couldn't come at a better time for the Red Wings. "We wouldn't be winning [without him]." Babcock said. "Helm and [Joakim Andersson] and their lines, that's why we didn't change those lines at all. They've both been excellent. We've got two lines that have been going, so tonight we have to make sure we have four." If they can do that, and keep it up until the injured return, Detroit might be better off in the long run. "That can bring a team closer together when you have guys come together and you've got to win games in a different way than you're used to," Weiss said. "If you find different ways to win as a hockey club, it can help you grow and help you as the season gets into the 'Dog Days.'"